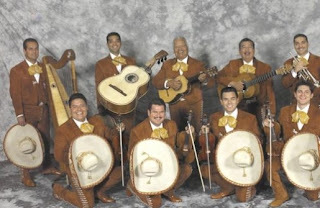 Pictured are L.A.'s famous "Mariachi Los Camperos." Growing up in a Latin American family, it is the tradition that you have a Mariachi Band perform at your wedding reception. If you don't know what a Mariachi Band is, you can go to wikipedia to find out. My wedding was no exception. We had the Mariachis playing poolside at a Palm Springs area hotel where my reception took place. They played beautifully, from what I was told, since I felt like I was in Mars that day. So I don't remember too much from that day. 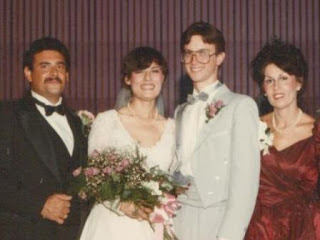 My wedding day, 1985 If you've ever seen the movie "Mi Familia" with Edward James Elmos, Jimmy Smit, Esai Morales and Jennifer Lopez, you will recognize the similarities of this photo... Father wearing a tux. . . mother wearing taffeta. Even my husband, when watching the movie's reception scene, says, "Wow, honey, look! It's your parents!!" Recently, here in Washington, my sister, who had been visiting from California had wanted to go record shopping at the local thrift shops, as well as buying every mexican style blanket she could find. I, of course, am looking for 45's. At one thrift shop, I find two 45's that seem interesting, mostly because they are in spanish. I have no idea what type of music is on these records, but I don't care. My sister is bummed that I got to the records first. From then on, it's a race at every thrift shop & used record store. When we get back home, I'm going through what I hope will be subjects for this blogsite. There's one that catches my eye. . . The label seems like it might be from a small company. 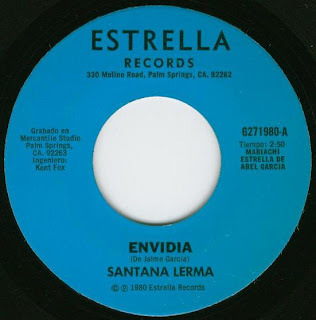 . . "Estrella" it says at the top. Reading the side. . . hmmm. . . WOW!! Palm Springs!! What the heck!! 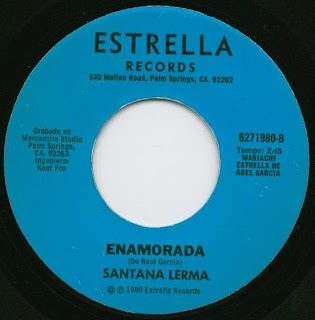 The artist, "Santana Lerma" I don't recognize. So, I have to call my dad, who because of his experience in the restaurant business, knows alot of the musicians in the Palm Springs area. Palm Springs is a small town, everybody knows everybody. I tell my dad about the record I found here in Seattle. He doesn't recognize the name of the artist, either. I tell him the 45 is from 1980. And on the right side of the record it says, "Mariachi Estrella de Abel Garcia." My dad says, "m'ija, dozz (those) are da (the) mariachis that played at joo (your)weddding! Dey (they) are friends to mine." (accent and grammar usage is important here to get the full flavor). Well I am surprised to say the least. And impressed. The songs are good!!! And as far as my wedding day, I was not able to enjoy Mariachi Estrella's wonderful performance. This is one of my regrets, aside from being an hour and half late to my own wedding, but that's a story for another day. I know you will enjoy these songs. THAT is a cool story... AND hilarious!! You are a hoot! I love the way you tell stories! Hope we're not going to have to wait too long to hear the story of why you were so late on your wedding day. I enjoy Mariachi music, but it makes me wish I spoke Spanish. It's been my goal to learn for many years, so maybe music will be what finally pushes me to learn. Hello I'm pleased to hear your story. Yes, my mom has a couple of those records that my dad left being before passing away. His name is Jaime Garcia the who composed "Envidia" and many others. Abel Garcia is my uncle and still plays here in the valley. Mariachi Estrella came out in 2 or 3 movies in the late 70's and early80's. My uncle Raul Garcia, doesn't play anymore and lives in Yuma, Arizona. You can find a couple of videos of Mariachi Estrella de Abel Garcia, on youtube.